In season 13, players can once again receive a new class set from Haedrig’s Gift for completing chapters 2, 3, and 4 of the Season Journey. The set, of course, depends on the class of the character:... As a magician, you get the firefighters set, which is currently strong. 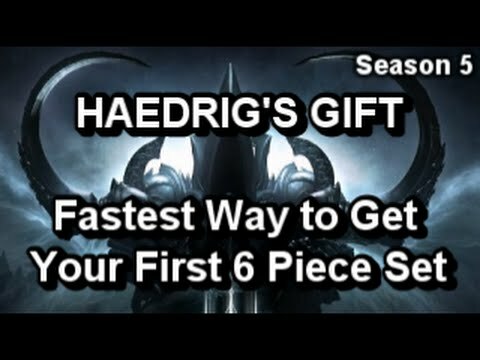 If you are a Crusader, you will receive the Requests Set from Haedrig's Gift. Season 11 is introducing two new pieces to the Conqueror set, a Treasure Goblin-themed portrait, and an Emerald Dragon pet — all seen respectively above. Additionally, players will be able to earn a class-specific armor set from Haedrig’s Gift, a cache earned for completing Chapters 2, 3, and 4 of the Season Journey. As a magician, you get the firefighters set, which is currently strong. If you are a Crusader, you will receive the Requests Set from Haedrig's Gift. Haedrig’s Gift Finally, just as before, you’ll get a shiny new Class Set courtesy of Haedrig’s Gift for completing certain chapters in the Season Journey. We’ve listed the available Sets below. I'm playing a Furious Charge build Barbarian this Season (IK6/R4) but I haven't managed to get a Ring of Royal Grandeur yet. It's the final piece missing from my build, which is currently IK6/R2 so I tend to run out of steam unless I charge a group of 5 mobs or more. It's a fun build, though.